Last Wednesday Federal Reserve Chair, dammitjanet Yellen, made her scheduled press statement after the regular meeting of the Federal Open Market Committee (The Federal Reserve Board of Governors - the private (not public) bankers committee that issues our dollars in digits and in paper). Since the transcript of her statement is impenetrable and sooooo boring, I thought I would paraphrase it for OEN readers -- so that we all know where we stand in the hierarchy of global finance. Good afternoon. Nearly five years have elapsed since the too-big-to-fail banks destroyed the global economy, taking with them your jobs and your homes. Led by the resurgence of General Motors, which just recalled eight million autos for ignition failure, the US economy has recovered to the point that yachts, Swiss chalets and Tiffany diamonds have all seen remarkable sales growth. Today I will discuss how my banker cronies on the Federal Open Market Committee see the current state of private wealth enhancement and how we plan to continue devaluing your pathetic little savings accounts until your great grandchildren die of emphysema. We at the FOMC do not believe that equities are overvalued in the current environment, and have set a target for the Dow Jones Industrial Average of 200,000 by 2015. We will keep printing money until every one of you has capitulated and put the last dime of your life savings into US stocks, taking all of this wildly overpriced garbage off of our hands, so that we can sell short, crash the market, and force you all to bail us out once again. I want to first outline the many successes the Federal Reserve Board has logged since my ascent to power, and how pleased we are that all US stock indices skyrocketed to new highs just as I stepped up to the podium. We are finally seeing gasoline prices rise to over four dollars a gallon once again, so one of our main goals has been met. Our zero interest policies, while bankrupting most Americans over the age of 65, have produced startling benefits of which we are duly proud. First, the two billion dollars in free counterfeit money we lend to the money center banks on each and every trading day has allowed them to run stock prices to unheard of new highs that have enriched the top .1% of Americans beyond our wildest dreams. It will now be possible for them to afford to purchase all elections on the state and federal level, and do away with the inconvenience of standing in those voting lines. That only multi-millionaires can qualify for any bank loan does not concern us, as we strongly believe that banks must be free to distribute all depositor money among the senior staff. We have successfully broken the corporate bond market such that effective zero interest loans have enabled America's largest corporations to buy back millions of shares of stock, doubling their stock prices and allowing CEOs to increase their annual salaries to an average of 20 million dollars per year. This is quite an accomplishment. Statistical studies tell us that real inflation in food and energy prices is at 10.7%, rather than the 2 % we targeted; but we will do our best to keep up our obfuscation by substituting canned sardines for chicken, pink slime for beef, and tap water for milk in the consumer price index to make certain that we can always and forever report a steady inflation rate of two percent. We at the FOMC believe that Spam and powdered milk constitute an adequate diet for the 99% of you who do not shop at Bergdorf's or drive a BMW. We note that prices for many consumer staples are holding steady or declining: Spotted bananas, used underwear, books authored by Ann Coulter. The list goes on and on. Deflation is our one true enemy, because we bankers really need you 99%ers to be massively in debt so that you will acquiesce to whatever police state policies we throw at you and will not have the resources to leave the US for a real democracy someplace else. We also understand that real unemployment is at 23 percent, but we will hold to our claims of 6.7% even though the few jobs created in the last five years were minimum wage jobs, from which we deduct 50% in taxes to finance our new wars against Russia and China. In summary, the policy framework I have described reflects the FOMC's commitment to systematically respond to the needs of our nation's aristocracy, enabling them to own all real estate in the United States, and extract maximum rents from all of you little people. Now that I have reassured all of the stock brokers in the audience that I plan to continue printing money forever, will never raise interest rates, and stand ready to purchase every stock listed on the New York Stock Exchange with an additional 14 trillion dollars in newly printed taxpayer dollars in the event the S&P falls by more than one tenth of one percent, you may all carry me out of the room on your shoulders and pop the champagne. Party on, Wall Street. 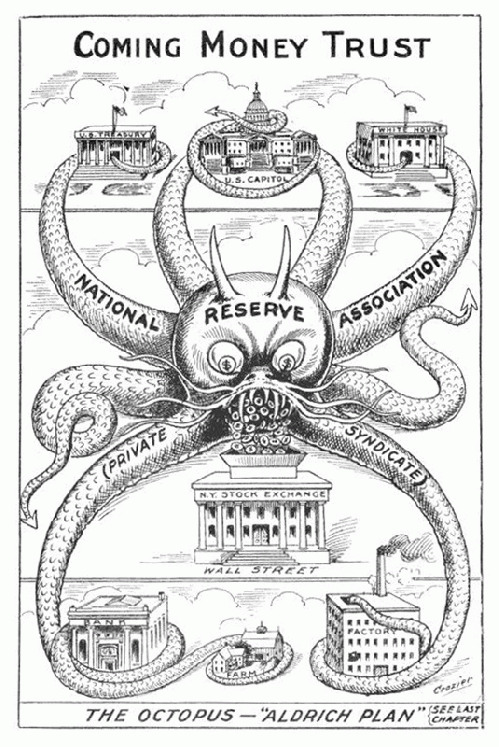 View All 2 Articles in "Satire"
View All 3 Articles in "The Federal Reserve"